Bournemouth defender Elliott Ward has been ruled out for three months after manager Eddie Howe confirmed he has had knee surgery. Ward, 29, had an operation earlier this week and, as a result, will miss the start of pre-season training. It's not a bottomless pit and we think we have been very wise with what money we have spent and I will always think long and hard before asking Max for more money. He has made 25 appearances for the club this season having signed permanently from Norwich in the summer. 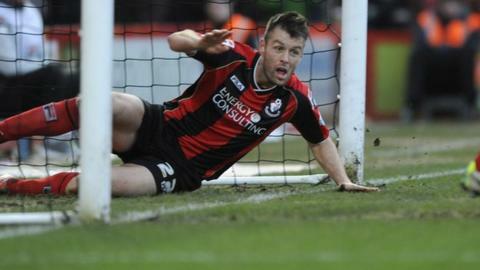 "We are hopeful it's not too serious, but we are looking at about 12 weeks before he returns," Howe told the club. Meanwhile, Howe says the club's spending on players and wages has been done responsibly, despite their debts rising. The Cherries recorded losses of over £15m for their promotion-winning 2012-13 season, and player wages rose over £7m. But Howe says all the spending he has done has been for the long-term benefit of the club, and with the consent of owner Max Demin. "He doesn't want to be shelling out that money and we are trying to put things in place so he doesn't have to," Howe told BBC Radio Solent. "We are trying to develop our own players but I think in those figures you have a whole range of things not just player wages and transfer fees but also the development of the stadium and training ground and all the infrastructure. That will not be lost. There is a lot of investment going on for the future of this football club." Cherries chairman Jeff Mostyn released a statement on Wednesday saying the "ends justified the means" and Howe echoed that sentiment. Howe also reiterated that Russian Demin was committed to the club for the long term. "We've had to recruit and spend money to push the team on and it's going to be a delicate balance," he said. "It's not a bottomless pit and we think we have been very wise with what money we have spent and I will always think long and hard before asking Max for more money. He has made it clear it is not a bottomless pit and we do have to act responsibility. He added: "Max would not have invested the money he has if it was a short term project. He has is own aims and dreams for the club and I think he will want to see them realised. "The challenge for us it to make that happen as quickly as possible. But I have said this to Max there are no guarantees in football."